Sephora perks and rewards just got better. If you are a Sephora VIB or VIB Rouge, you are now welcome to choose between five birthday gifts, rather than two. One of those gifts is a VIB + Rouge 250 rewards bonus points credit. These reward points can be applied to future Rewards Bazaar gifts.. I'll take it! 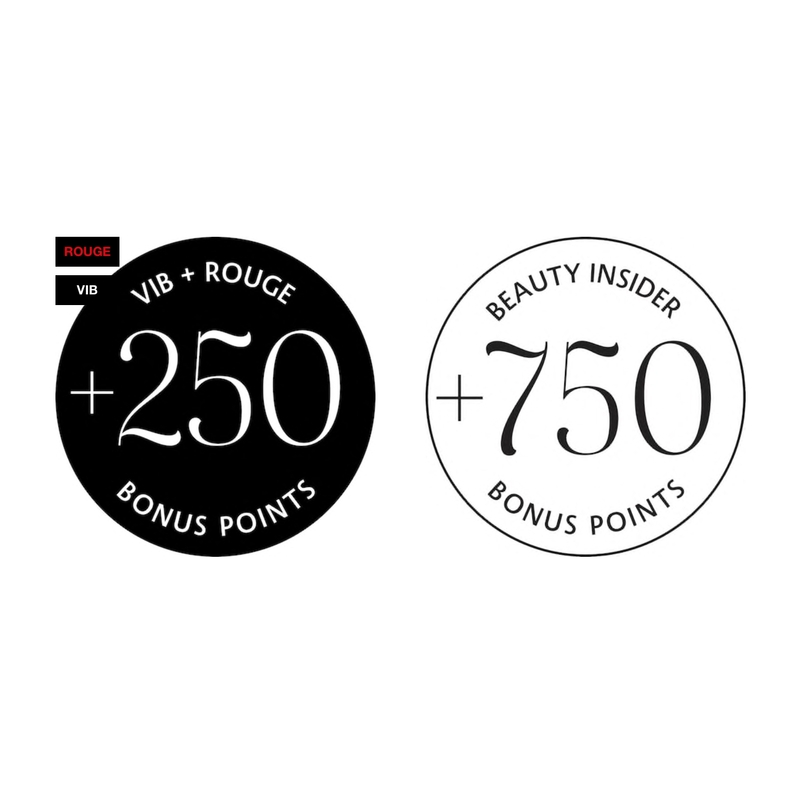 Beauty Insider's Rouge and VIB Rouge also receive an annual rewards credit - Choose Your Tier Celebration Gift. You can choose four makeovers to share, 750 bonus points or free flash shipping. I'm a VIB Rouge member (and already have free flash shipping). I chose 750 bonus points. January was a good month for me at Sephora - I gained 1000 points aside form the points I gained purchasing products! Here's the BIG one - you can add TWO beauty offer codes to your cart. There are restrictions (many restrictions), but if you plan accordingly, you can add a deluxe size sample AND a discount code. Who doesn't love a discount and gift with purchase. Albeit, the restrictions are fierce, so be patient and get the most out of this new Sephora perk. I've been a Sephora Beauty Insider for almost ten years! I have a ridiculous amount of points. I used to spend my points on deluxe-size samples and cosmetic sets - Earlier this year, Sephora launched 'Rewards Bazaar'. The revised membership program drops amazing one-of-a-kind experiences, services from Sephora, as well as other top brands, and deluxe-size samples and sets every Tuesday and Thursday. I guess I'm not the only Insider with an enormous amount of points, and they had to create a platform for all the product junkies to spend their points. Rewards Bazaar rewards range from 100 - 15,000 points (so the site claims)! BUT, I recall seeing rewards upwards of 30,000 points. SO YOU KNOW - for every dollar spent at Sephora, you get one point. This program is brilliant, and makes being a loyal Sephora customer worth every dollar spent. These epic rewards go fast. I had my eye on a Wildfox + Sole dutch-style bicycle. I had to have this bike - Every Tuesday and Thursday, I sat at my computer and waited for the new rewards to appear (refreshing the site often). These rewards drop between 9:00 am - 5:00 pm PT. I almost had the bicycle.. It was in my cart, and by the time I reviewed all the other products and chose samples, the bike was sold out. WHAT THE F**K - it was in my cart. Apparently, these rewards cannot be reserved and held in your cart for even a minute. Only 15 bikes for 5000 points, and they were sold out in three minutes! I'll admit, I'm a bit stingy with my points. I'm not gonna spend them on just anything. A few months ago I snagged the IGK Great Escape Hair Set (pictured here). The reward included an IGK pouch, travel-size products - Jet Lag Invisible Dry Shampoo, Beach Club Texture Spray, Rich Kid Coconut Oil Gel, Hot Girls Hydrating Shampoo and Conditioner, Call Time Styling Primer, an IGK hair tie, Hot Girls hair clip and hotel-style 'Rich Kid' slippers. I'm a HUGE fan of IGK and will definitely use everything in this set. It was well worth the 2000 points. If your not a Beauty Insider, join the club. Even the 100 point deluxe-size samples are worth the membership. Each month new 100 and 500 point rewards are posted. The 500 point rewards are kits containing four - five products from a single brand. These make great gifts. I'm a beauty blogger and purchase all of the products posted on b.a.grogie. Rewards for my dollars spent are very much appreciated. Thanks Sephora!